I have some problem to print all size on a qss 3702HD, all prints, on a minilab with triple magazine , go out with Biased Image. see image encloused. I don't know, where begin? The image is too small to see what is there wrong. Please make gray test and scan it with 600 dpi. Then pace it to any file exchange server and place the link here. May be such way we will see what you have. There is a lot of probable causes for such image bias. 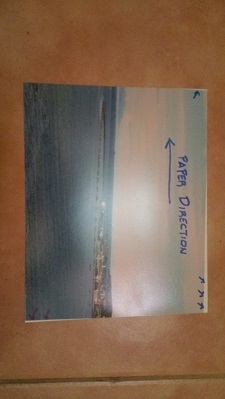 The main cause of the bias of the image is: something does not allow paper go smooth during the exposure process. First, check the quality of all relay contacts in Printer I/O PCB (it controls the pulse motor responsible for paper movement during the exposure process). Check the condition of this motor. Sometimes the brushes of the motor are worn out and the motor can make the stop during the paper move. thank Yustas, but the image quality is good, and paper go out straight from Dryer , like seem the image from laser is biased. Did I write anything about quality? Or about how it goes out from dryer unit? Of course, it will go out without bias from the dryer. I wanted to say that the problem is in the initial stage of exposure when paper sheet hit something inside of the exposure section and laser makes the image not like it prescribed. Maybe somebody has another thought, ask them, please. OK, thanks a lot, I checked paper exposure deck and there is a little belt like seem worn, part H016866-00 belt. I can help you with spare parts - we have been selling spares more than 23 years already. All will come to your home address, directly from Noritsu (Japan). If you need anything else- you can order it to reduce shipping expenses. If you do not need any parts to add to this belt - so, I think, you should look for this belt at your local market. Although H016866-00 is called [ Belt ] by Noritsu. It is actually a (O-Ring) diameter. 3.5cm rubber band like ..
Do you have W410414-01 LVDS cable for QSS-32xx ? W410414-01 has been discontinued. Sorry. Hello, can you please help me with Capacity Booster J Install files, that is used with 3702HD, We lost CD and need to reinstall. Thank you very much.